We get asked all the time for reliable digital hardware for our clients message on hold applications “Is there something out there that we can use and forget about in between message changes?” ~ In a nutshell, “Yes”. Message On Hold productions come in a wide variery of forms and quality ~ Telephone Magic offers professional scripting, announcing, and studio engineering. When it comes to hardware, it has come a long way from the early days of cassette tape decks with continuous loop tapes. Once the hardware went digital a cassette simply downloaded itself to the memory of the hardware and “voila” your message was up and running. These units are still in use today with few, if any, issues. Now the convenience factor and the latest technology has created a USB key version On Hold Message digital announcer. This system allows you to get your message productions emailed to you. From there it’s a simple “drag and drop” of the file to your USB key and once you plug the key back into the unit at the phone system, everything is taken care of for you. The USB 1100 is a digital message unit designed for continuous audio playback. Audio is stored on a removable USB Flash drive and plugged into the USB hub on the unit. The loading of the audio is easily done by “dragging and dropping” mp3 file(s) without the use of special software. Audio files can now be emailed to clients without the need to mail or ship physical media. Standard MP3 Playback: MP3 audio is widely recognized as a popular audio compression format. You can use MP3 files with sampling rates from 32 to 256 kbps, depending on the quality you require. No additional software is required to load MP3 files to the USB flash drive. Select one of six tracks or “play all” by pressing the Play Mode button on the side of the unit. Electronic Delivery – Very user friendly! – The process of receiving message on-hold updates is easy! Simply remove the USB flash drive from the unit, and plug into the USB port of a computer. Audio files are a “drag and drop” transfer from the computer into the USB flash drive. Plug the flash drive back into the USB 1100 for instant audio playback. Your on hold message producer can simply e-mail you the files for your message-on-hold updates. 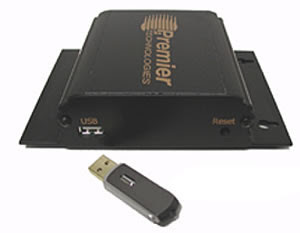 Save the MP3 file to the USB flash drive and load it into the USB 1100 – quick and easy! Commercial-Strenth Hardware: The USB 1100 is intended for use in business applications that include message-on-hold and in-store music / announcements. The system has a constant power source and the solid-state memory will re-boot the audio playback automatically after a power outage. No more need to reset the unit when the power’s been out! The durable aluminum case can withstand rugged phone room conditions and reduces possible RF interference. The compact design and visible flanges ensure an easy installation on the phone room system’s wall. Volume & Tone Control: Two different outputs are designed to provide adequate volume for any phone system. You can also adjust desired bass and treble levels. Technology and convenience in a compact easy to use format, all at a reasonable one-time price. Nothing could be easier… If you wish to gain some professional scripting and production assistance, don’t hesitate to call Telephone Magic @ 905.356.9199. This entry was posted in digital message hardware, message on hold, message on hold hardware, message on hold system, oh hold, on hold messages on May 24, 2011 by jjackson.